The elegant actress was clicked at a recent press conference and was looking stunning in an outfit by styled by Pallavi Singh. Manjima Mohan is predominantly known for her curvaceous frame and traditional looks. Apart from being a fine actress, she is also appreciated for being able to carry off any ensemble with utmost elan, raising the bar each time she decides to experiment with a look. Recently, the actress attended a press conference and put her best fashion foot forward. 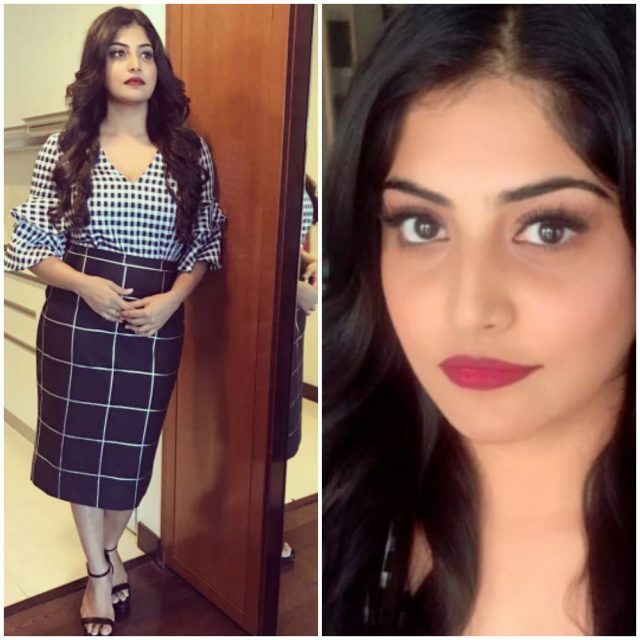 Styled by the talented Pallavi Singh, Manjima worked a fitted high waist monochrome skirt and a statement sleeved v-neck top. What’s interesting about the look, is how two prints have been clubbed together and raise the style quotient of the outfit to a whole other level. Though both are monochrome and have checks, they’re very distinct and different from each other. Pallavi has tactfully played around with these two, and we must say, we’re quite enjoying the view! Manjima’s beauty look was a plum lip colour, that made her lips look luscious and full, and her eyes were highlighted with a thin line of kohl on top, with long, prominent lashes to give it that pop. Defined brows and clear skin with a hint of blush, rounded it off. For her beautiful long tresses, curls was the choice for the evening and went perfectly with the look. Black strappy heels completed the look. For those of you who love blacks and whites, be it separately or clubbed together, this summer we suggest you take a style cue from our very own South belle, and don’t refrain from experimenting with different sizes of checks, or even different prints, for the that matter. Add a pop colour matte lipstick to break the monotony and tadaah! You’ll be ready to turn heads wherever you go. This is the best season to experiment with different hairstyles too, be it a crop-cut or curls. So go all out and unleash your inner fashionsita, you’ll be sure to make a statement, just like the lovely, Ms. Mohan. For more stylish updates and fashion tips, watch this space!